This private efficiency apartment with outside entrance is located at the end of a 2001 built private home in the woods. Your accommodations include a full kitchen, bath with shower, living/sleeping area, and outside deck. Located only minutes from downtown Boothbay Harbor, this apartment is on a picturesque peninsula in East Boothbay, a quiet, quaint shipbuilding village. 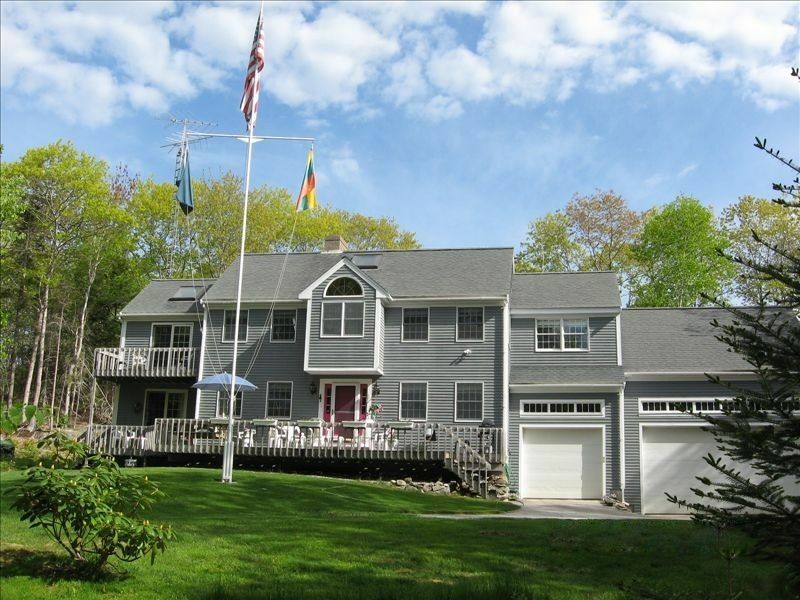 Within walking distance are unlimited ocean views of the picturesque, rockbound Maine coast. Nearby is an association dock which offers full benefits for ocean access, and boating in the briny deep. Owner's 32 foot inboard boat is moored within this harbor, and a guest tour of harbor, lighthouses, and offshore islands, ( time and weather permitting ) is a possibility. Local attractions abound, such as hiking trails, a dinner theater, fishing excursion boats, numerous restaurants ( which offer the freshest of seafood along with other specialties ), quaint gift shops, tour boats for whale watching and island tours, and beaches for swimming. Use the above Photo Tab Left or Right to see All Photos, and A Novel Video of our Apartment and Surrounding Area Views. We are proud to have been a member of VRBO since 2001. Known as Eleanor & Pete Yes, we retired here in Maine and drove local school busses. Pete’s job before he retired included extensive travel throughout North America and other countries. Eleanor was a stay at home Mom with a lot of interesting part time jobs such as dog officer, welcome wagon hostess, school bus driver ( 36 years wow! ), newspaper reporter, and dog groomer. We sold our two acre 200 year old farm in MA to retire to Maine and built a new home in the heart of the Mid Coast, and we love it here and want to have you enjoy it too..
We chose the area of the Boothbay region for it’s uniqueness: we are a community of boat builders, fishermen, beautiful islands, rocky shoreline with some sandy beaches, unusual seabirds, a gorgeous new Botanical Gardens, quaint shops, great restaurants for unusual dining of fresh seafood along with standard fare, lots of wonderful hiking trails, and lovely conservation areas. When we had our home built on the coast in East Boothbay 21 years ago, we added a unique benefit in the form of an “in-law” apartment for Eleanor’s Mom. After she passed on, we decided it would be fun to share our wonderful world here with those who have never seen the Maine Coast, or those who love it the way we do! The apartment has been updated with new furnishings, kitchen appliances etc. and we delight in taking our guests off-shore in our 32 ft lobster-style yacht to see the islands, quaint coves, lighthouses, and harbors. This efficiency apartment was perfect for us. Quiet yet just minutes to everything. It is very nicely located in East Booth Bay with much privacy just a 1 minute drive to Ocean Point (with phenomenal sunsets) and 5 minutes to downtown Booth Bay Harbor with dining, shops and tour boats. There are several good hiking spots nearby. Our hosts Pete and Eleanor were incredibly nice. When we arrived, Eleanor gave us a tour of the area which was very helpful. Pete is a wealth of knowledge if you have any questions. He has a nice boat and was happy to give us a ride in it. They are both lovely people but not at all intrusive. The apartment has a full kitchen with a full size refrigerator which we appreciated, cable TV and wifi. We had all the comforts of home. Pete even let us store our bikes in the garage which was helpful. I feel it is a good value and we would definitely stay here again. From the moment we arrived we felt at home,maybe because of the effusive welcome,or maybe because of the really splendid apartment,equipped with everything we could possibly need.It is sett on a private road,very peaceful and with a glimpse ot the water through the surrounding trees. where we all had very good ice cream.A truly wonderful way to start a holiday,genuinely unforgettable. We would not hesitate to recommend this as a great place to stay. Thanks for your review! It sure added to the pleasure we had with you staying here on Mid-Coast Maine. My husband and I stayed here for about a week during August. The area is beautiful and relaxing with lovely sea and inlet views nearby. Eleanor and Pete are delightful hosts with a gift for hospitality. Everything is well-organized and welcoming. It is also very nice to have a full kitchen with anything you might need and pleasant places to sit outside. The apartment has it's own entrance and a good sense of privacy. It was also nice to know Eleanor and Pete were available (and very happy) to answer questions and give local advice. We both found it to be more relaxing and private than a B&B. One thing I really appreciated and found relaxing is that Eleanor and Pete give you a sense that this is your home for the week -- so go ahead and use the deck, move furniture around a bit, make a bouquet of ferns, make yourself at home : ) My husband and I have very good memories of our stay here -- from a wonderful boat rides and ice cream to walks on an old rock dam -- not to mention the amazing lobster and charming Boothbay Harbor! Pete & Eleanor were very gracious and fun to get to know. They took me out on their boat on Sunday afternoon with a trip around the area, showed me around the harbor, took me to see a couple of lighthouses, and treated me to an ice cream. After returning back to the house, Eleanor helped me learn my way around town for shopping, groceries, parking for excursions, and showed me where to go to see an amazing sunset one evening. The apartment is well stocked with dishes/utensils, etc, needed, very clean and comfortable. I would highly recommend this area and their home for a base to stay and explore this part of Maine. We had a wonderful stay in Eleanor and Pete's apartment. Very cute and comfortable. Eleanor and Pete were very hospitable. Eleanor took us on a tour of Boothbay Harbor when we first arrived to help us become acquainted with the area. The apartment was in a good location to many of the interesting harbor towns and lighthouses. One of the highlights of our stay was when Eleanor and Pete took us out on their boat on a sight seeing tour of the harbors and islands. They took us to Damariscove Island and we enjoyed a picnic lunch aboard their boat. We saw seals sunning themselves on rocks and saw dolphins swimming. We would definitely recommend a stay in this adorable efficiency apartment.